Caribbean islands situated on continental plate boundaries have shown promising geothermal potential, estimated in the region at 850 megawatt. 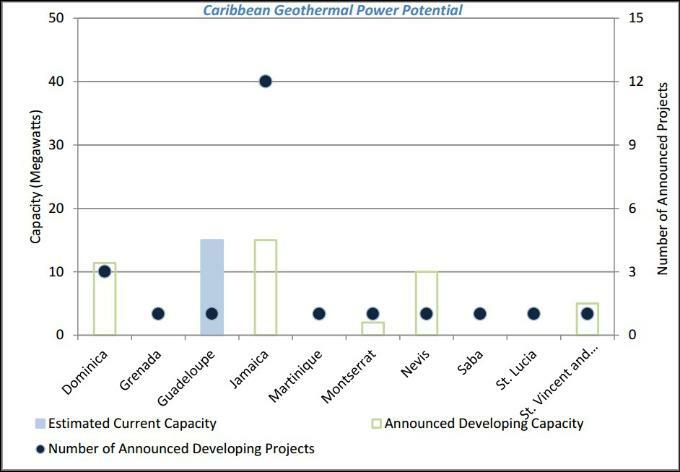 The chart above compares current installed geothermal capacity to “announced developing capacity,” the estimated power plant capacity reported for a specific site by a private company, government agency or contractor associated with the site. According to the Geothermal Energy Association, ‘there is enough geothermal potential in the region that these countries could meet their own needs and export the energy they have leftover’ – cites the October report, “The Status of Geothermal Power in Emerging Economies”. The Caribbean Development Bank (CDB), Japan International Cooperation Agency (JICA) and the Inter- American Development Bank (IDB) recently signed a cooperative agreement to encourage renewable energy in the Caribbean. They plan to diversify energy sources through renewable energy, with an emphasis on geothermal energy. In recent news, Saint Lucia will receive $2.8 million from the World Bank to begin a Geothermal Resource Development Project. They plan to use the funding for exploration, development and the implementation of a geothermal program in the area. The country is also working to modernize its energy regulatory body to attract developers to develop the energy industry. According to a 2008 study by the University of the West Indies, St. Lucia’s estimated geothermal potential is 680 MW. In addition, St Vincent and the Grenadines announced in September 2014 plans for a potential small geothermal power plant. Surface exploration indicates high geothermal potential near Mount Soufriere. Companies Emera and Reykjavik Geothermal will provide financial support for exploration in the area while the New Zealand government is helping with technical guidance. Recently, the government was granted a loan of $15 million to help fund the development of a 10-15 MW geothermal project, expected to come on stream by 2018. The concessional loans come from the International Renewable Energy Agency (IRENA) and the Abu Dhabi Fund for Development (ADFD).